The U.S. Environmental Protection Agency has established the National Ambient Air Quality Standards for six principal air pollutants (criteria pollutants): carbon monoxide (CO), lead (Pb), nitrogen dioxide, particulate matter in two size ranges [less than 2.5 μm (PM2.5) and less than 10 μm (PM10)], ozone, and sulfur dioxide (http://www.epa.gov/air/criteria.html). While associations have been identified between these pollutants and adverse health effects, considerable uncertainty remains with regards to methods and approaches to understanding which gas or particulate components are most toxic, which sources and source combinations emit these compounds and their precursors, the mechanisms of actions of the pollutants and their causal relationships to adverse health effects, effect of confounding factors that obscure the relationship between toxicity and health, and which populations are susceptible. The pollutant – health relationship is all the more complicated for particulate matter since it is composed of many components and is distributed over a wide range of sizes that differentially deposit in human airways (EPA 2006a [ozone criteria document (CD)], EPA 2006b (Pb CD), EPA 2008a [NOx integrated science assessment (ISA)], EPA 2008b (SOx ISA), EPA 2009 (PM ISA), EPA 2010 (CO ISA)). Air pollution and health research continues to reduce these uncertainties across the source-to-health effects paradigm as described by the National Research Council (NRC 1998, 1999, 2001, 2004), EPA (EPA 2006a, b, 2008a, b, 2009, 2010), and Solomon et al. (2011a and references within). Linking air pollution to adverse health effects and minimizing the risk from air pollution is complicated and requires expertise across a range of scientific disciplines from atmospheric to exposure to health sciences as well as inclusion of air quality managers and policy makers who develop and implement Policies related to reducing air pollution on national, regional, and local scales to protect public health and welfare. Interaction among these groups at different points in time helps to identify gaps in knowledge and suggests future research directions. March 2010 provided one such opportunity through “Air Pollution and Health: Bridging the Gap from Sources to Health Outcomes,” an international specialty conference by the American Association for Aerosol Research (AAAR, http://aaar.2010specialty.org/; Solomon et al. 2011a). The conference was chaired by Drs. Paul A. Solomon (U.S. EPA) and Maria Costantini (HEI) and was designed to help disseminate and integrate results from scientific studies that cut across the range of air pollution and health-related disciplines of the source-to-health effects continuum. Conference objectives are listed in Table 1. The conference addressed the science of air pollution and health within a multipollutant framework, focusing across five key science areas: sources, atmospheric sciences, exposure, dose, and health effects as identified by the NRC (1998). Eight key policy-relevant science questions that integrated across various parts of these science areas formed the basis of the meeting. A ninth question addressed the policy implications of the findings. The science questions are listed in Table 2. This was AAAR’s third international specialty conference and extends the findings presented at AAAR’s first specialty conference “Particulate Matter: Atmospheric Sciences, Exposure, and the Fourth Colloquium on PM and Human Health,” Pittsburgh, PA, 2003 (Davisdon et al. 2005). 1. Bring together researchers from across the source-to-health outcomes paradigm (NRC 1998) to engage in discussion and rigorous debate regarding the latest information on linking adverse health effects of air pollution to emissions sources and atmospheric pollutants. 2. Communicate effectively the latest information to scientists, air quality mangers in the public and private sectors, and policy makers in support of developing efficient and cost effective approaches to decreasing acute and chronic adverse health effects from air pollution on community and regional scales. The conference theme is multipollutant focusing on the sources, fate, and health effects of ambient air pollutants. The meeting is designed to appeal to a large interdisciplinary international audience. 3. Highlight findings from major measurement, data analysis, and modeling studies and programs conducted since the last AAAR PM and health conference in 2003. Papers and presentations that show linkages from sources to air quality and/or air quality to health outcomes are strongly encouraged. 4. Add significantly to the peer-reviewed literature by publishing research results presented at the conference in a variety of special issues of selected journals and or synthesis papers. 2. Reliability of methods, models, and approaches: How reliable are methods (measurements and models) and approaches (epidemiological and toxicological) for studying and quantifying the links between air pollutants (species and or sources) and adverse health effects? 3. Pollutant characterization and population exposure: How do relevant pollutant properties vary in space and time from sources and in ambient air; what are the implications of these variations for population exposure? 4. Relation between exposure and dose: What advances have been made in understanding the relationships between exposure, both spatially and temporally, and estimates of dose that tie to health outcomes? 5. Mechanisms of action and biomarkers of exposure and effects: Are patterns emerging that relate component(s) of air pollution and/or source types to mechanisms? What is the status of identifying and measuring biomarkers of exposure and/or adverse health effects from air pollution? 6. Susceptible populations: Who are the susceptible populations, what drives different susceptibilities to the same or different air pollutants, and are there susceptibility traits associated with specific health outcomes that are common among the subpopulations? 7. Confounding or other factors: What roles do confounding or other factors have in increasing, decreasing, or obscuring attribution of the true health effects from ambient air pollutants? 8. Accountability: Do actions taken to improve air quality result in reduced ambient concentrations of relevant pollutants, exposure, and health effects, and have we encountered unintended consequences? 9. Regulatory and policy implications: What are the policy implications of our improved understanding of the source to health effect paradigm? Results from the 2010 AAAR Air Pollution and Health conference are being published in six special journal issues [Air Quality, Atmosphere and Health—this issue and a second addressing the science questions directly (Solomon 2011a), Inhalation Toxicology (Solomon 2010), Environmental Health Perspectives (Solomon 2011b), Aerosol Science and Technology (Solomon 2011c), and Atmospheric Environment (Solomon et al. 2011b)]. All six special issues will be published by spring 2012. 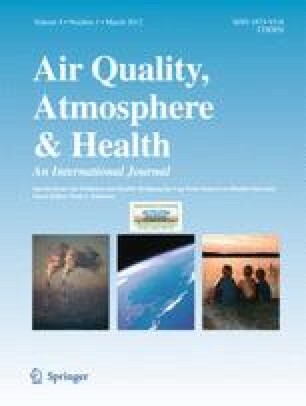 This special issue of Air Quality, Atmosphere and Health includes selected papers from the Air Pollution and Health Conference that align with the goals and objectives of this journal. Study objectives described in each paper align with the conference science questions as indicated in Table 3. Key findings also are presented in Table 3 with brief descriptions of the projects given below. To provide an overview of the 2010 Air Pollution and Health Conference by engaging experts in the field related to each of the science questions, which formed the basis of the meeting, to respond to the questions based on the material presented at the meeting supplemented with over 200 peer-reviewed papers. In addressing each question, authors also provide Concluding Remarks noting recent advances and knowledge gaps/research needs. The conclusion consists of policy-relevant insights gleaned from the scientific finding and developed by experts in science and policy. Many key finding are noted and reaffirmed as expected given the depth and breadth of the conference, which covered most aspects of air pollution from sources to health effects. Of particular note at the conference was the need to have a greater focus on multipollutant science and management approaches that include more direct studies of the mixture of pollutants from sources as well as an emphasis on health studies at ambient concentrations. A number of associations were noted between pollutants and a range of health effects, including mortality. Some of the pollutants included elemental carbon, certain organic species, ultrafine particles, and certain trace elements such as Ni, V, and Fe(II), as well as some gaseous pollutants, such as ozone. Ultrafine particles were noted as having strong associations with various cardiovascular and respiratory effects. PMc was associated with respiratory effects, such as asthma. One mechanism repeated and reaffirmed at the meeting included the role of species that generate reactive oxygen species known to increase oxidative stress, and thus, inflammation, which has been linked to numerous adverse health effects. To examine PM2.5 mass and composition to better understand seasonal variations in concentrations of the measured components, the influence of meteorology, physicochemical profiles, and to estimate the number of excess deaths due to PM2.5 concentrations above the WHO PM2.5 standard of 10 μg/m3 in six major Brazilian cities, the largest of which was São Paulo, all of which are state capitals in Brazil. It lasted more than a year with daily sampling. PM2.5 mass among the cities ranged from 7.3 μg/m3 in Recife the city with the lowest population to 28.1 μg/m3 in São Paulo with a metropolitan area population approaching 20 million. Meteorology also influenced differences among the cities. Concentrations of PM2.5 and components were generally higher in the winter than the summer, the latter being the rainy season. Black carbon, noted from heavy duty vehicles, composed up to 38% of the PM2.5 mass. Four of the cities had BC concentrations in the range of 3.5 to 4.5 μg/m3; São Paulo 10.6 μg/m3, all much higher than BC concentrations typically observed in most US cities. The number of deaths attributed to the excess PM2.5 concentrations above the WHO standard, by metropolitan region, was estimated based on an existing equation in the literature. These ranged from 0.3 to nearly 10 per thousand of population, the latter being in São Paulo. To identify the sources contributing to PM2.5 mass concentrations in six major cities in Brazil, all being state capitals, including: São Paulo (the largest city in Brazil and one of the largest in the world); Rio de Janeiro; Belo Horizonte; Curitiba; Recife; and Porto Alegre. The specific focus was to quantify the fraction of PM2.5 mass due to motor vehicle emissions, since motor vehicles, burning ethanol, gasohol, and diesel are the primary source of pollution in these cities. Absolute principal component analysis (APCA) was used to apportion the data into factors that were then related to sources based on the chemical composition identified with each factor. The contribution of PM2.5 attributed to motor vehicle emissions could not be distinguished in all cities by the data obtained in this study due measured PM2.5 components distributing among several factors. For those that could be distinguished, motor vehicles made significant contributions ranging from 50% in Rio de Janeiro, 17% Belo Horizonte. Motor vehicle emissions contributed about 40% in São Paulo. Soil and crustal material, biomass burning, and fuel oil combustion from various industries were other major sources identified as contributing to PM2.5 concentrations in these cities. The faction of PM2.5 mass not explained by APCA mostly ranged from about 20% to 30%. To examine the relationships between vehicle tailpipe and evaporative emissions and resulting pollutant concentration levels observed in an attached garage and adjacent room (kitchen) due to the influence of vehicle type (sedan versus pickup truck), its operational mode (normal versus high emitting mode), and fuel type (conventional versus oxygenated). Higher concentrations of pollutants were typically observed in the garage relative to the kitchen and during vehicles’ cold start mode independent of parameter tested. In general higher concentrations of MSAT pollutants were observed in both locations from the truck than the sedan as well as higher concentrations observed during the high emitter mode. Higher concentrations of CO, 1,3-BD, BTEX and MTBE (for MTBE fuel) were observed in the garage and to a lesser degree in the kitchen for oxygenated fuels than for the petroleum fuel. To evaluate the impact of petroleum diesel and a soy-based blend [20% biodiesel/80% petroleum diesel (B20)] on occupational and environmental PM2.5, EC, and OC exposures at a municipal materials recovery facility utilizing heavy duty diesel nonroad equipment. Concentrations/exposures of PM2.5 and EC in the various settings were significantly reduced when biodiesel fuel was employed compared to petroleum diesel use. PM2.5 and EC reductions ranged from 56% to 76% and from 5% to 29%, respectively. However, concentrations of OC were increased during biodiesel use from 294% to 467%. The authors suggest the higher OC maybe due to higher emissions of soluble organic carbon when soy diesel is used as noted previously in the literature or maybe due to variability in operating modes of the different sources in this real world study. To determine if county-by-county brain cancer incidence and mortality rates are correlated with geographical patterns of local ambient air pollution, including criteria pollutants (except Pb) and a subset of EPA’s identified HAPs. Slight positive correlations were observed with cattle density and brain cancer incidence and mortality rates and none were observed with the ambient pollutants included in this exploratory analysis. To evaluate potential toxicological differences between inorganic components observed in urban and rural PM as a function of season and toxicity as measured by an in vitro analysis that measured surrogates for oxidative stress, inflammatory response, and cytotoxicity. Irrespective of season, the generation of ROS occurred at all three sites, although greater at the urban than rural site. Differences in the concentration of some transition metals between urban and rural areas may be the reason for the observed differences in ROS generation. Other parameters did not correlate with site. Results suggest that the toxicity parameter IL-6 is related to season since the highest IL-6 responses were collected in the summer. The first paper in this issue presents an overview of the results presented at 2010 Air Pollution and Health Conference described above (Solomon et al. 2011a, this issue). The summary is presented along the lines of the eight science questions and the ninth presenting policy insights based on those findings. Experts in their field related to the topics of each question were asked to integrate and synthesize the results from the presentations and add context and background with peer-reviewed literature. Many of the presentations are noted by abstract number with the abstracts included as electronic supplemental material to the overview paper. Many of the latest and yet to be published findings are described in the overview to ensure the information presented at the conference was captured and to help disseminate the information beyond those that attended the conference. Concluding remarks at the end of the response to each question include a statement about recent advances as well as a subset of knowledge gaps based on the material presented to provide guidance for further research planning efforts. The next two papers examine PM2.5 mass and composition in six major cities in Brazil, all of which are state capitals. The paper by Miranda et al. (2011, this issue) describes daily measurements of PM2.5 mass and composition that were obtained over more than a year in each of these cities at locations with high traffic volume but also influenced by other sources that varied depending on the city. Annual and seasonal average differences for PM2.5 mass and composition are described among the cities. Variations are described due to meteorology and known sources within each city. Excess deaths, estimated based on PM2.5 mass concentrations above the World Health Organization’s (WHO) guidelines of 10 μg/m3 also are presented with a maximum observed value of 10 deaths per thousand people in São Paulo, a significant number since the city has a population of nearly 20 million people. Apportionment of sources at the same study sites using principal component analysis is described in the second paper by Andrade et al. (2011, this issue) focusing on the contribution of vehicle emissions to PM2.5. Vehicle emissions explained up to 50% of the PM2.5 mass. Other major sources that varied depending on the city included crustal material, biomass burning, and fuel oil combustion from industries. In Belo Horizonte, mining was the major source identified since it is located in an area of Brazil where there are large reserves of iron ore, gold, diamonds, phosphate, zinc, aluminum, limestone, and semiprecious stones. Papers by Zielinska et al. (2011, this issue) and Traviss et al. (2011, this issue) examined differences in exposures to emissions from different fuel types. In the first paper, Zielinska et al. examined the effects on mobile source air toxics (MSAT) concentrations due to vehicle type (sedan versus pickup truck), operational mode (normal versus malfunction/high emitter), and fuel type (conventional versus oxygenated) and compared observed pollutant levels in the attached garage and adjacent kitchen to better understand exposure to individuals living in a similar house. Other possible emissions sources (gas can and lawn mower) typically observed in garage were included in all tests. Five scenarios were evaluated: (1) background, no vehicle; (2) hot soak vehicle; (3) cooling vehicle; (4) cold vehicle; and (5) cold start. Pollutants measured included CO, CO2, BTEX (benzene, toluene, ethylbenzene, and xylenes), MTBE (methyl tertiary butyl ether), 1,3-butadiene (1,3-BD), formaldehyde, and acetaldehyde. Differences were observed between the garage and kitchen and between the truck and sedan as well as between fuel types depending on the scenario. The second paper (Traviss et al. ), compares occupational and environmental exposures from petroleum diesel fuel and biodiesel (20% soy-based blended with petroleum; B20) at an isolated municipal materials recovery facility that had four primary pieces of common nonroad equipment used to move materials around the facility. PM2.5, EC, and OC were measured at various locations in the facility including in the cabin of the equipment, work area, and near field. All equipment burned the same fuel over about a 2-week period and a change in fuel types in the equipment was separated by a transition period to ensure testing of the fuels independent of each other. PM2.5 and EC concentrations/exposures were found to be lower while OC values higher when the equipment in the facility burned B20, indicating a major change in PM composition. The final paper in this issue, by Healy et al. (2011, this issue) examines toxicological differences between the fine inorganic chemical components of PM, defined here as PM in the size range of 0.1 to 2.5 μm, and biological effects as determined by exposing in vitro human lung epithelial cells (A549) to the collected PM. Samples of fine PM were collected during different seasons at urban and rural locations in Cork, Ireland to allow for seasonal differences to be investigated. The toxicological experiments focused on oxidative stress, inflammatory response, and cytotoxicity by measuring the generation of intracellular ROS and the release of several proinflammatory mediators to represent cytokines involved with inflammation. Principal component analysis followed by partial least squares regression was used to examine associations between biological responses and composition. Some differences between rural and urban samples were noted including differences in PM composition and generation of ROS, both being higher in urban areas than rural. Seasonal differences were noted with some of the proinflammatory mediators. The 2010 AAAR Air Pollution and Health Conference would not have been possible if not for the generous support by a number of sponsors that included: U.S. EPA, Health Effects Institute, American Chemistry Council, American Petroleum Institute, California Air Resources Board – Research Division, Electric Power Research Institute, NARSTO, National Aeronautics and Space Administration, National Institute for Public Health and the Environment (RIVM), National Oceanic and Atmospheric Administration, South Coast Air Quality Management District, Southern Company, Air & Waste Management Association, International Society of Exposure Sciences, and Springer. The American Association for Aerosol Research (AAAR), the professional society sponsoring the meeting, along with Association Headquarters, AAAR’s management company, also was pivotal in making the conference a huge success. Special thanks are given to the conference co-chair, Maria Costantini, to conference committee members as listed at http://aaar.2010specialty.org/ and in the conference program (http://aaar.2010specialty.org/pdfs/2010_Specialty_Conf_Final_Program.pdf), and to those who attended and participated in the meeting. The U.S. EPA through its Office of Research and Development funded and managed the development of this preface. It has been subjected to the agency’s administrative review and approved for publication.